Noddle Cos. estimates that private investment within Aksarben Village has topped $630 million. Those involved since the onset say the project, boosted by tens of millions of public dollars, has exceeded expectations. Office and research space has doubled the amount projected to be built; the number of hotel rooms and residences also have surpassed early predictions. To better understand the land evolution near 67th and Center Streets, one can step back 25 years to when elite horse racing died at the longtime entertainment venue. Controversy soon erupted as diverging interests vied for control of Ak-Sar-Ben land then publicly owned by Douglas County. One group wanted to restart racing in an effort that some suspected would lead to casino gambling. Business leaders resisted, instead supporting a sale to First Data Resources, which was looking for space to grow. First Data bought the northern 140 acres of the Ak-Sar-Ben grounds in 1996 and subsequently donated a large chunk to the University of Nebraska for a high-tech learning campus featuring the Peter Kiewit and Scott Technology educational institutes and student dorms. As community leaders in the mid-2000s pondered what to do with remaining land to the south, HDR’s Doug Bisson stepped up to say Omaha had the chance to be at the forefront of an emerging “new urbanism” trend of creating walkable neighborhoods inside cities. At the time, he was a neighborhood representative on the board of the Ak-Sar-Ben Future Trust, a nonprofit that by then had acquired the former horse track and coliseum. A handful of developers, with Noddle Cos. as lead, accepted the challenge to transform the 70 acres into a kind of pedestrian-friendly, mixed-use hub that was becoming the rage in urban parts elsewhere across the country, Bisson said. Noddle recalls drawing up, in 2005, the first site proposal for what would become Aksarben Village. Actual construction launched in 2007 with the thought that it could take about 12 years to fill out between Center Street on the south, the University of Nebraska at Omaha’s south campus on the north, and from 63rd Street west to the Keystone Trail. Looking back, Bert Hancock of Alchemy Development, who was among those original developers, said one of the most stunning results is the village’s allure as a home for corporate bases. 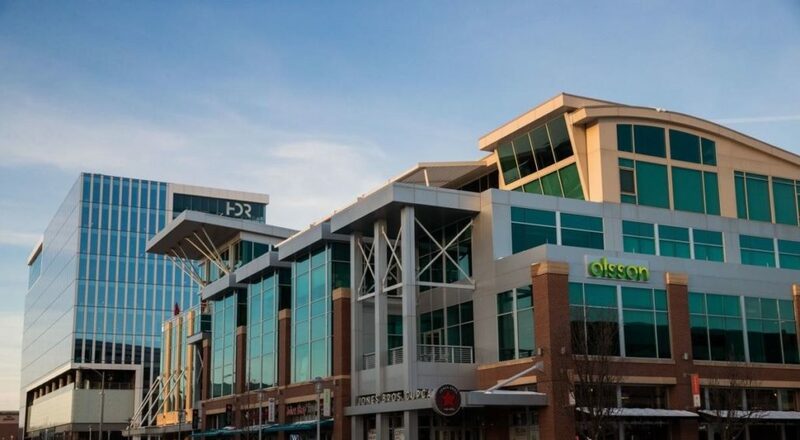 “While I think everyone envisioned a strong employment base, the headquarters of HDR, Green Plains, Blue Cross, Right at Home, etc., have elevated Aksarben Village’s status as a major corporate center,” he said. HDR’s near ten story headquarters located in Aksarben Village accompanied by a neighboring building with restaurants, businesses and offices near Mercy Road and south 67th Street in February. 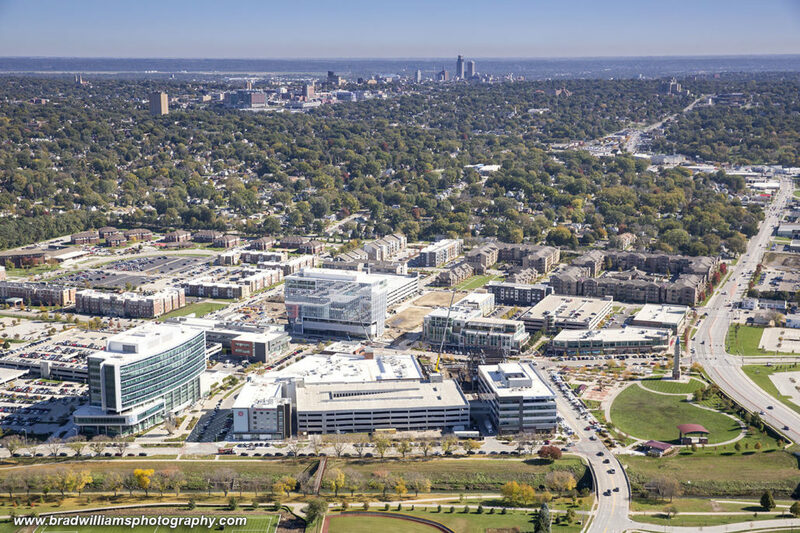 Earlier this year, engineering and architectural firm HDR held the grand opening of its 10-story global headquarters leased from the Noddle-Bradford partnership. Across the street, a five-story office building is rising and in January will be corporate headquarters for Right at Home. That 100,000-square-foot building, a project of Magnum Development and McNeil Co., will have room for other tenants and retailers on the ground floor. It joins a city block within the village that also features a 10-screen movie theater, restaurants, bars and Pacific Life offices. 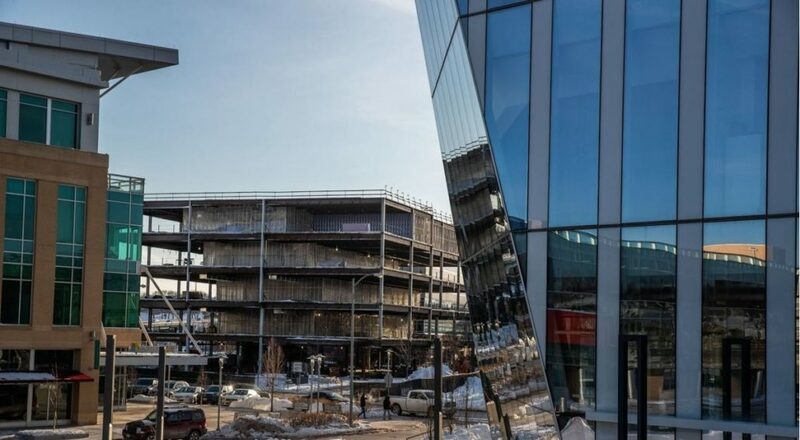 A 110,000-square-foot, multitenant office building is to rise behind the new HDR headquarters, facing Frances Street, probably later this year, Noddle said. “We own the land, there is demand,” he said, though adding that construction won’t start before he secures an anchor tenant. The HDR parking garage will be enlarged to accommodate additional vehicles. Noddle Cos. this year also plans to start building the village’s first for-sale homes. Called 64 Ave, the seven town houses along 64th Avenue north of Center will be about 1,600 square feet apiece, rise three floors and have two-car garages. This would be Noddle Cos.’ debut in the residential construction market. Set to open this summer is the food, retail and entertainment alleyway between the HDR headquarters and its parking structure. The plaza will be called the Inner Rail, a nod to the area’s history as a racetrack. It’s gotten city approval to be an “entertainment district,” which will allow alcoholic drinks in the plaza. Yet to be developed, Noddle said, is about seven acres next to HDR that’s reserved for its possible expansion, and a few other scattered pieces. We are excited to announce our newest apartment project in Aksarben Village. The building will feature 62 studio, one and two-bedroom units. We expect completion in early 2021. This building will be adjacent to to our other projects Pinhook Flats and CUE Apartments. We welcome our newest neighbors: 950 HDR employees now working at the the new eleven-story HDR Headquarters. There was a hilarious video making the rounds on social media last week that featured a pigeon strutting around a barnyard with a puffed up chest and its head cocked high in the air. The pigeon was imitating a flock of brown chickens who were parading about, pecking at the seeds on the ground. I did what anyone would do when presented with such fantastic barnyard comedy: I pressed the screen and gave the pigeon a heart sign. I sought deep meaning in this pigeon strutting about. It must be some kind of zoological phenomenon. Genetic mirroring or telepathy. Do pigeons have ESP? 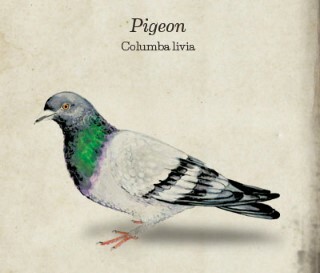 I have little knowledge of the biological world, and much less about the psychology of pigeons, so I gave up this notion. Instead, I decided this pigeon must have something to do with interest rates. A natural conclusion. I couldn’t help but wonder which bird was better off. The chickens were destined for one of those plastic containers with the transparent lids sitting under heat lamps, but they would end up on someone’s dinner table. A meal for a happy family. A short life, but a useful one. The pigeon seemed free. It could fly off at the first sign of the farmer. But it’s death was certain to be grisly: Picked apart by a marauding hawk or flattened by an onrushing vehicle. You can delude yourself into believing that your fate is different, but the end result is the same. In the long run, we are all dead. So goes the old economist joke. Interest rates are the great equalizer and the tombstone of many speculators are marked with a percent sign. Rising interest rates don’t care much if you’re a pigeon, chicken, or real estate developer. Yes, it’s one hell of a stretched analogy, but I’m running with it. If you have borrowed a lot of money (something real estate developers love to do), rising interest rates can foul up (or fowl up) any investment equation. To see why, let’s look at a hypothetical building that generates income from rents. After paying expenses, the owner is left with $1,000,000 per year in net operating income. How does one value such a building? The equation is fairly simple, you take the net operating income and divide it by an interest rate known as the capitalization rate, or “cap rate” for short. The cap rate is a weighted average cost of capital. It weighs the investor’s desired return on his or her equity invested as well as the borrowing cost of debt. The cost of debt is more than simply the interest rate. It includes a factor for the amortization of principal. The resulting cost of debt is known as an annual constant. In November of 2016, the 10-Year Treasury Yield stood at 2.15%. Lenders usually price their loans at about 2% above the Treasury (known as the spread). So, in November of 2016, the rate was 4.15%. Once you add on the amortization of principal (let’s use 30 years as the amortization term), the annual constant was 5.90%. What was the hypothetical the cap rate? Assuming the developer sought a 7% return on equity and the equity comprised 25% of total capital, the resulting cap rate was 6.175%. What’s $1,000,000 of annual income worth? $16.2 million. The developer was able to borrow about $12 million and made up the balance of the funding with equity of around $4 million. Today, the 10-Year stands at 3.24%. The annual constant is 6.63%. Holding the desired return on equity at 7% results in a weighted average cost of capital of 6.72%. Dividing $1,000,000 by this cap rate results in a value of $14.9 million. This is a decline of 8%. The developer borrows $11.1 million and invests equity of $3.7 million. All is well and good. The value declined, the debt declined, and the equity required declined in tandem. But what happens when the building was built in 2016 and now its time to refinance a construction loan in November of 2018? We said the developer initially put up $4 million for a $16 million building. The debt amount of $12 million made up the difference. Now the building is worth $14.9 million. The bank will only loan $11 million. The developer must make up the difference between the original construction loan and the new permanent loan. An additional $1 million of equity is required – a massive 25% increase. This horrifying situation is already playing out on the global stage. Today’s news brought reports that Chinese developers face $55 billion in debt renewing in 2019. Already Chinese Evergrande, perhaps the world’s biggest developer, witnessed a $1.8 billion bond issue go begging. Fortunately, the majority owner Hui Ka Yan was able to personally put up $1 billion to salvage the deal. Meanwhile Indian developers facing a glut of luxury condominiums have watched short term funding costs surge. Investors have pulled $30 billion out of the money market accounts of non-bank institutions that fund such developments. Indian developers are suddenly in a mad dash for capital. Pigeon meets hawk. Chicken meets guillotine.